Life Before the Dinosaurs: Cothurnocystis. Cothurnocystis (coh-thur-no-SIST-is) was a strange genus of carpoid, which is an unsymmetrical animal that's either an echinoderm or a relative of an echinoderm. Cothurnocystis means "cothurnus bladder" (a cothurnus is a thick boot). Cothurnocystis had a brain at the end of its tail. Some people believe that Cothurnocystis is a chordate, which is anything with a notochord, with or without a backbone. A notochord is like what is inside of a backbone. But Cothurnocystis did not have a backbone surrounding its notochord, so it was not a vertebrate. At first people believed that Cothurnocystis's tail was a stalk, and that it attached itself to the sea floor or any other object with the stalk. Now people think this is unlikely. 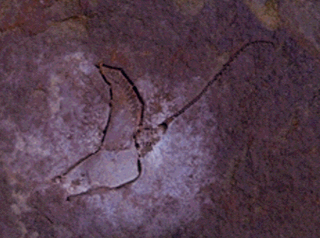 They now believe that Cothurnocystsis lay flat on the sea floor and used its tail to move about. To feed, Cothurnocystis sucked water through a siphon, then filtered it out through gills on top. Bivalves feed the same way, but they don't have the same type of gills. 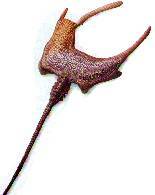 Cothurnocystis was four inches long, and probably had to avoid nautiloids such as Cameroceras. Cothurnocystis could have moved by slithering, like snakes do today. But that's only my hypothesis. 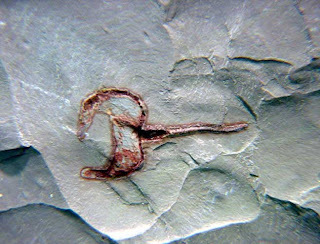 This well-preserved fossil of Cothurnocystis shows the delicate tail, which is not usually preserved.